Allstate Foundation awards a child’s Nonprofit Organization its first grant! 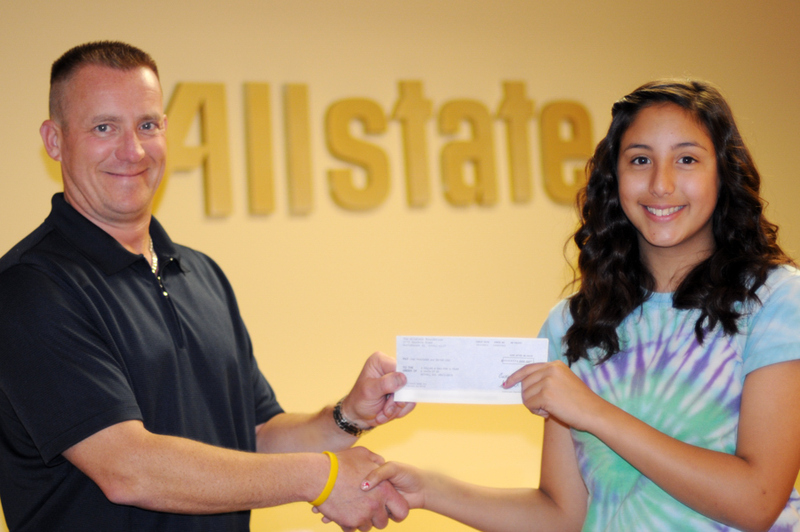 A Dollar A Day For A Year, brainchild of 14-year-old CJ Sternfels, receives a $1000 grant from The Allstate Foundation. The Foundation offers several grant programs to support charitable organizations where Allstate employees, agency owners and personal financial representatives volunteer. “This will help us with our expenses as we launch PLEDGE365 this summer. It couldn’t have come at a better time!” Stated Christine Sternfels, Co-Founder of the organization. Thank you Allstate Foundation, we are very grateful! Kevin Giboney, Principal of Just2Dads and a Board Officer of A Dollar A Day For A Year, hands a check from Allstate Foundation to CJ Sternfels, Co-founder (and future CEO) of A Dollar A Day For A Year.